Opinion pieces are dangerous things. “One accurate scientific measurement is worth a thousand expert opinions” as’ Admiral Grace Murray Hopper’ is reputed to have warned. But sometimes an opinion can be a useful way of airing a view which might be at best, a hunch, a value judgement, or maybe even a scientific fact. The low energy strategy passive house design is fast approaching 25 years of scientific facts, and so the challenging question for practitioners today is how can we best link exemplary construction with everyday building practices and on-site behaviours. ‘Top-down’ legislation – as per Ireland’s recent Building Control Regulations (2014/15) – is of little use without a simultaneous ‘Bottom-up’ transformation in the way we educate our workforce, commission, tender and construct buildings. We urgently need significant social housing yet we have ungainly legislation and a dearth of leadership. This opinion piece is based loosely on the following facts, value judgements and hunches. Which is which, I leave to the reader. Small decisions are often agonised over, while really big decisions are made with abandon. Significant policy decisions, particularly when politically opportune, rarely get the scrutiny and circumspection they deserve. 14. Dublin is Europe’s capital city for solar space heating suitability. A house in Ireland can meet more than 20% of its space heating demand through solar for eight months of the year, versus seven months in Hamburg and six in Frankfurt. The really difficult things in construction are full of small decisions. The person making decisions on site should be encouraged to take responsibility for them. 15. More people die annually as a result of bad housing than die on the roads, or by suicide. We need to ask why this is not a priority issue for society to address. Trying to design a low energy building without adequate airtightness is akin to watering a garden with a sieve. The intentions of Part F of the Building Regulations are not aligned with the aspirations of Part L. Excess renewables are not an adequate substitute for poor construction. 16. Every €1 spent locally within communities to create good low energy social housing returns €3 to €4, based on savings made against fuel poverty, reduced hospital stays, better health outcomes, job creation and increased disposable incomes. The 23% VAT rate on professional services (such as passive house design) negates the use of such knowledge, denying future generations of the long term benefits. All insulation materials should also be zero vat rated. 17. Addressing why people die due to bad housing requires money, effort, sweat and maybe some tears. Above all it needs government departments to talk to each other – Health; Social Protection, Environment; Energy; Prime Minister and Finance. One suspects this isn’t happening. Sub-contractors do not a good main contractor make. PPPs are not a panacea for quality or effort. Low tenders destroy cooperative construction. 19. If professionals cannot shout ‘STOP’ against building control regulations which are paper heavy, legally fraught, expensive to implement and not fit for the consumer, then who does? You cannot change a building control system in two years; the entire Irish system needs to be significantly re-thought and education, professional and training systems need time to change. 21. Architecture in general is neither a fine art nor utilitarian engineering; it is a craft-based skill combined with intelligent, beautiful design. Good construction is the result of collaboration and communication and shared values, not unreasonable lowest cost tendering. Ireland’s new building control system is a privatisation of risk, and a deskilling of local authorities. (In line with the fact that Ireland is one of the most politically centralised administrations in Europe). 22. No amount of inspection plans, site inspections or occupancy certificates will protect a project against a tradesperson with the attitude: ‘I am only here from the neck down’. To quote Admiral Hopper again, ‘you manage things; you lead people’. Good politicians everywhere are good at being re-elected; everything else is a bonus. 23. Good low energy buildings start with south facing strategies. Planners need education in low energy design and site planning. Government departments protect their own budgets first; cooperation with other departments does not appear to be part of their default value system. 24. Front doors do not always have to face the public road. Windows do not have to ape traditional proportions and construction. Comfort, low energy and good architecture are mutually inclusive. Construction quality is a challenge from the bottom up as much as from the top down; we need a strategy to meet in the middle; blue collar and white collar makes green collar. 25. Fenestration can be aesthetically subjective; in PHPP, fenestration is objective regarding energy use. If north points have to be shown on plans let them be relevant to the design. Inappropriate orientation costs money. Many skills within the construction industry can only be taught through apprenticeship. Architecture might well be one. In 2014 only four plasterers in Ireland registered for apprenticeship. Dublin is Europe’s capital city for solar space heating suitability. A house in Ireland can meet more than 20% of its space heating demand through solar for eight months of the year, versus seven months in Hamburg and six in Frankfurt. More people die annually as a result of bad housing than die on the roads, or by suicide. We need to ask why this is not a priority issue for society to address. Every €1 spent locally within communities to create good low energy social housing returns €3 to €4, based on savings made against fuel poverty, reduced hospital stays, better health outcomes, job creation and increased disposable incomes. Addressing why people die due to bad housing requires money, effort, sweat and maybe some tears. Above all it needs government departments to talk to each other – Health; Social Protection, Environment; Energy; Prime Minister and Finance. One suspects this isn’t happening. ‘Professionalism’ is dead; killed by lowest cost tenders. Professional institutes have become mere trade unions for their members’ interests; they might be better served by being more vocal advocacies for their communities. If professionals cannot shout ‘STOP’ against building control regulations which are paper heavy, legally fraught, expensive to implement and not fit for the consumer, then who does? Lowest tenders are not necessarily better; average tender values give a more accurate reflection of true project costs and also ‘professional’ services. Architecture in general is neither a fine art nor utilitarian engineering; it is a craft-based skill combined with intelligent, beautiful design. Good construction is the result of collaboration and communication and shared values, not unreasonable lowest cost tendering. No amount of inspection plans, site inspections or occupancy certificates will protect a project against a tradesperson with the attitude: ‘I am only here from the neck down’. To quote Admiral Hopper again, ‘you manage things; you lead people’. Good low energy buildings start with south facing strategies. Planners need education in low energy design and site planning. Front doors do not always have to face the public road. Windows do not have to ape traditional proportions and construction. Comfort, low energy and good architecture are mutually inclusive. Fenestration can be aesthetically subjective; in PHPP, fenestration is objective regarding energy use. If north points have to be shown on plans let them be relevant to the design. Inappropriate orientation costs money. To achieve real build quality we need a regulatory control system that rewards scientifically verifiable strategies such as passive house. We need a system that helps develop design skillsets and apprenticeship pathways through a stable construction sector, addressing fuel poverty, attracting low property tax and meeting local building regulatory requirements. We need a planning control methodology that allows strategic construction -stage revisions to refine energy use and focuses expenditure not just on paper trails but on good construction, adequately paid for by real average tender procedures. We need building contractors with verifiable construction skills, rewarded for having permanent specialist staff and project management skills answerable to a trained and supported local building control authority, in turn supported by a planning authority who might intervene within the free market to control ill-considered planning applications. If we actively support design influenced by science we may yet bridge the gap between blue and white collar and create a green collar construction sector that holds its rightful place within the economy of a country as opposed to being its economic flywheel. A top down legislative environment without responsible contracting, bottom up skills and verified design strategies serves no good. Martin Murray is an architectural graduate of Bolton Street COT, Trinity College and Rice University, Houston, Texas. 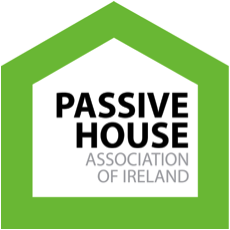 He is a Fellow of the RIAI, a Fulbright Scholar and an architect in private practice in Ireland; he is also a former chairman and founding member of the Passive House Association of Ireland and a current Director. His architectural practice is principally involved with energy renovation projects across a wide range of building types.